Nintendo surprised industry watchers today by announcing it has sold 4.5 million units of the Nintendo 3DS in the United States in the first year since its introduction. The figure itself isn’t all that impressive in the context of a company that has sold hundreds of millions of handheld gaming systems around the world — what’s a few million more over the span of a year? However, the figure marks a very impressive turnaround for the the company’s latest handheld gaming system. Nintendo had banked on the 3DS’s innovative glasses-free 3D technology to make it an instant hit with consumers, but instead consumers balked at the cost and capabilities, particularly in the United States were Nintendo managed to sell a mere 110,000 units during the 3DS’s second quarter of availability. How has Nintendo managed to turn the 3DS around? Two ways: pricing and content. The Nintendo 3DS got off to a reasonably strong launch. Gaming fans in both Japan and the United States boosted the device’s first quarter sales by lining up to get their hands on the latest and greatest. But then things took a very sharp negative turn: After the initial adopters, there seemed to be no one willing to buy a Nintendo 3DS. The situation was bad enough that Nintendo president Satoru Iwata had to cut his own salary in half — and placed the blame not only on the company’s deflating Wii franchise but on the poor launch of the Nintendo DS. In July 2011, Nintendo posted its first quarterly loss since 2003. Blame for the 3DS sales nosedive largely landed on two factors: the unit’s $250 price tag, and the lack of compelling content that leveraged the 3DS’s 3D display. Key titles for the platform kept having their launch dates pushed back, and without 3D content the 3DS was essentially the same as the DSi and DSI XL units that came before it. Nintendo also had to face new competition in the handheld gaming arena. Anyone who thinks the iPhone, iPad, and Android aren’t major forces in mobile gaming isn’t paying attention. Nintendo promised to address these deficiencies, and seems to have found the Nintendo 3DS’s sweet spot, if recent sales figures are any indication. First, Nintendo slashed $70 off the retail price of the system, dropping it from $250 to $170 in the United States. Second, the long-promised stable of 3D-enabled content has finally started to arrive, bolstered by entrants from Nintendo’s own Zelda and Mario franchies. The result? 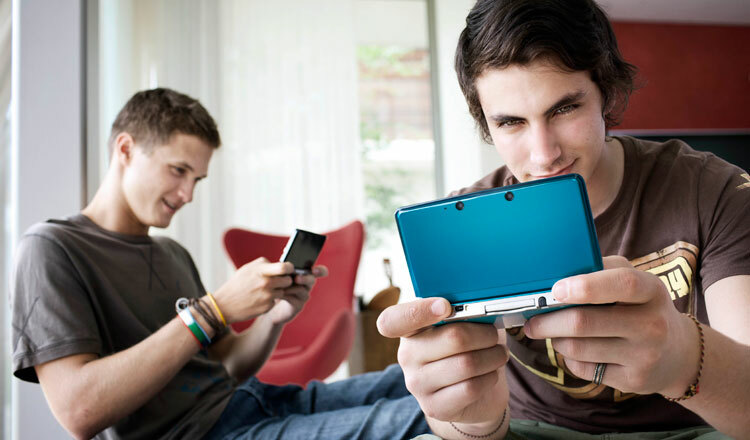 Nintendo 3DS sales have accelerated sharply in the United States. 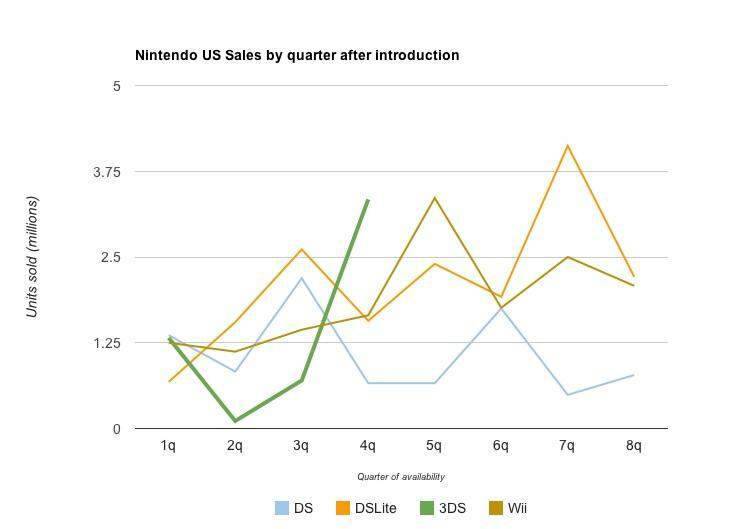 This chart compares the Nintendo 3DS’s first four quarters of sales, compared to the launches of the original Nintendo DS, the DS Lite, and the Wii console. These figures are bumped around a bit by offset holiday quarters, since they represent sales figures for systems first quarters of availability, regardless of where those quarter fell in the calendar year. In the United States, the 3DS is far ahead of the original Nintendo DS in terms of first-year hardware sales: 4.5 million units compared to 2.3 million for the original Nintendo DS. Nintendo also boasts more than 100 titles are now available for the Nintendo 3DS where only 58 were available for the DS in its first year, and total sales of the 3DS (hardware, software, and accessories) in the United States now total some $1.2 billion, where the DS managed only $540 million in its first year. In terms of total number of units sold during its first year, the Nintendo 3DS is neck-and-neck with the Nintendo Wii game console in the United States. Each moved nearly 5.5 million units in the United States during their first year of availability, although it’s worth noting the Wii was very supply-constrained during its first year: Nintendo could have sold many more, if only it could have made them. A key factor in the Nintendo 3DS’s flirtation with the dustbin of history is content. Nintendo brought The Legend of Zelda: Ocarina of Time 3D to the platform by mid-2011, but Nintendo managed solid hits with Super Mario 3D Land and Mario Kart 7 , both of which landed just in time for the end-of-year holiday buying season. Nintendo says it has sold 1.75 million copies of Super Mario 3D Land to date in the United States, along with 1.45 million copies of Mario Kart 7. Although Nintendo controls or publishes most of the top-selling titles for the 3DS, that doesn’t mean third-party publishers are out of luck: Activision has done well with Skylanders Spyro’s Adventure and Wipeout 2 , Sega’s Sonic Generations is popular on the 3DS, Disney is on the boards with LEGO Pirates of the Caribbean , and even Ubisoft has had some success with its crash-and-burn racer Asphalt 3D. Nintendo promises major new titles are just around the corner for the 3DS, including Resident Evil Revelations , Tekken 3D Prime Edition, Metal Gear Solid Snake Eater 3D . Of course, Nintendo won’t be out of the picture: After more than 20 years it’s bringing back Kid Icarus , and cashing in on the vampire-and-zombie craze with Spirit Camera: The Cursed Memoir . 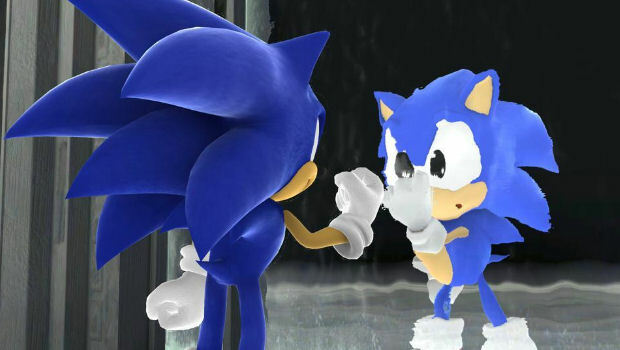 Nintendo is even teaming up with Sega for Mario & Sonic at the London 2012 Olympic Games. These titles and others should help fuel 3DS sales during 2012. But the 3DS’s popularity is not just related to games. An important factor in the Nintendo 3DS’s success in the U.S. market has undoubtedly been video: both the company’s own Nintendo Video and the availability of Netflix streaming. Suddenly the 3DS isn’t just a gaming platform or something with a few social networking services that really don’t compare to smartphones. Now the 3DS is an inexpensive way to let kids and teenagers watch some of their favorite movies and television programming in private. Nintendo Video pushes music videos, movie trailers, and exclusive featurettes (like comedy and animation) to user’s SD cards. Since the videos don’t stay available for very long, users constantly check for new content. A portion of the content leverage’s the device’s 3D display capabilities. Nintendo Video is free, but it doesn’t offer full-length content and its an all-or-nothing service: Either users pull down everything on Nintendo Video, or nothing at all. There’s no way to pick and choose, and even if there were ways for users to set preferences or define channels, there’s not enough content available to support them. However, Netflix is a different story. Just as the Wii console’s popularity was boosted with the availability of a free Netflix client, the 3DS has undoubtedly benefited from Netflix capability — and, amongst Nintendo’s handheld lineup, Netflix is unique to the 3DS. Nintendo is still selling the DSi XL, but Netflix capability would be a deciding factor for many buyers, even if they have no interest in 3D. Another factor in the Nintendo 3DS’s resurgence is the eShop is not only operational (it wasn’t available at all when the 3DS launched) but it’s actually starting to benefit users. Nintendo continues to boost the downloadable games available via eShop: March 15, Nintendo 3DS owners will be able to pull down the Sega Game Gear system to play classic SEGA games like Shinobi and Sonic the Hedgehog: Triple Trouble. Sega is also bringing the rhythm game Rhythm Thief & the Emperor’s Treasure to the eShop in April, along with a 3D platform game. Nintendo, of course, will be in the mix too with a rehash of the NES game Punch Out , a Mii-based golf game, and ArcSystem Works is launching a multiplayer soccer game where players can use photos of their own faces. But is 3D really all that? The real cloud hanging over the future of the Nintendo 3DS is whether consumers are really all that excited about 3D content, even if they don’t have to wear glasses. Although some of the 3DS’s top-selling titles (Mario, Zelda, and nintendogs + cats ) make reasonable use of the handheld’s 3D technology, others are essentially re-releases of Nintendo 64 titles. Anecdotal evidence seems to reveal what while many 3DS owners make some use of the 3DS’s 3D capabilities, many turn the 3D features off altogether because of difficulties or eyestrain. Users might not need 3D glasses, but that doesn’t make the 3D feature easy on the eyes. As users embrace the 3DS, they may not embrace 3D. Instead, the devices might mainly be used for older games (many top 3DS titles are old Nintendo 64 games, and Sega’s upcoming Game Gear titles are all re-issues) or watching standard 2D video. That said, the analog joystick, improved graphics, a genuine online component, and rapidly improving content options now make the Nintendo 3DS a solid choice for portable gaming fans…with or without 3D.